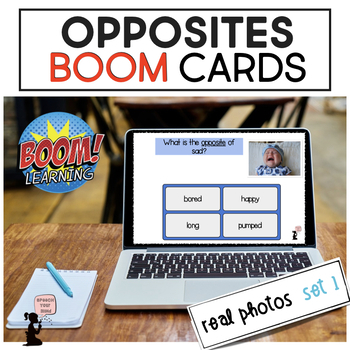 Opposites BOOM CARDS™ Real Photos BUNDLE ! Opposites BOOM Cards™ Real Photos! : Set 1 is an activity targeting receptive and expressive language skills related to OPPOSITES (ANTONYMS) in single words. Given a target word and the real photo, students will identify or determine the opposite. Awesome photographs help students make connections and relate to real-life. No Print! No Prep! Four levels are included to allow for branching and scaffolding for varying skill levels of your students. No Print! No Prep! Preview the activity here first! Level 1: Identify the OPPOSITE from pictures. The student will identify the opposite of a provided word / picture. Field of 4 picture options. Level 2: Identify the OPPOSITE from text. The student will identify the opposite of a provided word / picture from a field of 4 written options. Level 3: Type the OPPOSITE of the target word. Word Bank provided. The student will type the opposite of a provided word / picture. A word bank of options is provided. Level 4: Type the OPPOSITE of the target word. Word Bank NOT provided. The student will type the opposite of a provided word / picture. A word bank of options is NOT provided. 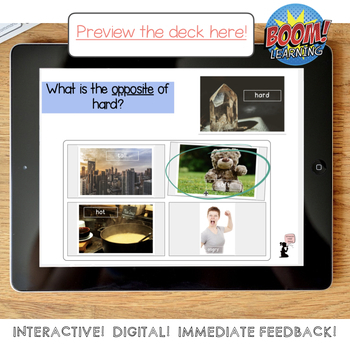 Super fun for students and provides immediate feedback! No printing, laminating, cutting, binding, or data collection necessary!! What do you need to do to get started with your BOOM cards™? With your Teachers Pay Teachers purchase, users new to Boom Learning℠ get a three-month free trial of student progress reporting for up to 150 students. Your trial includes the ability to make up to 5 free DIY decks. You may upgrade or cancel at any time. 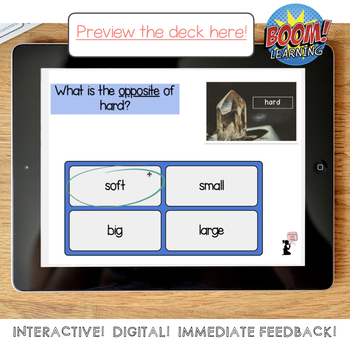 Boom Cards™ play on modern browsers (released in the last three years) on interactive whiteboards, computers and tablets. Boom Cards™ apps are also available. Not sure if your browser is modern enough? Try a free Boom Cards™ deck first. When you redeem your purchase, Boom Learning℠ opens an account for you if you do not already have one. If you do not subscribe at the end of your trial, you will be able to continue using Boom Cards™ with the Fast Play feature. Fast Play does not track individual progress. If you do not subscribe we will delete your student records 3 months after the expiration of the trial to protect student privacy. 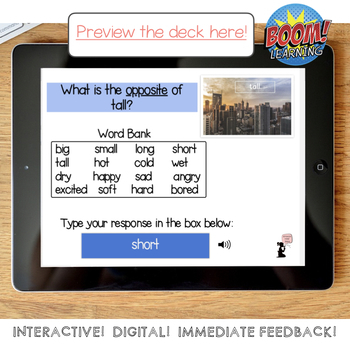 Verb BOOM CARDS™ Task Cards BUNDLE ! Follow me for therapy ideas, sales, inspiration, & more!